In recent times, Sligo has become something of a surfers' paradise. It's no surprise really with the rollers coming in off the Atlantic and spotless beaches to explore. Sligo is also W.B.Yeats country. He was born here and immortalised the county in his poems, particularly That old grey mansion. As Yeats captured so eloquently, this stretch of northwest Ireland is wild, unspoilt, and decidedly romantic, far removed from the hustle and bustle of Dublin and the larger cities. History, mythology, music, art, and poetry along with clear lakes, rivers, and dramatic mountains all await visitors to this remote part of Ireland. Around a 15-minute drive from Sligo town at Grange, a side road runs west to Streedagh where boats can be hired to visit the island of Inishmurray, still inhabited until the mid 1900s. Once ashore, visitors can explore a well-preserved monastic establishment founded by St. Molaise in the early 6th century. It was abandoned 300 years later after being raided and plundered. Poignantly scattered about the island are the remains of the former islanders' homes, the last of whom left in 1948. From St. Patrick's Memorial, at the eastern tip of the island, there are fine views of the mainland. Visitors can also access the island from Mullaghmore. The Model art gallery and cultural center is one of Ireland's premier centers for contemporary art. It takes its name from the "Model School" the 1862 building once housed. On site, visitors will find a restaurant, performance space, and a bookshop, while the top-floor artist studios afford impressive views over Sligo. The award-winning building is home to the Niland Collection of art, one of the most renowned collections in the country. Featured works include John and Jack B. Yeats, Estella Solomons, Louis Le Brocquy, and Paul Henry. Just under five kilometers from Sligo is this Bronze Age graveyard. Archaeologists have discovered some 60 graves (many unfortunately destroyed and others damaged) comprising the largest collection of megaliths in Ireland. Most are a mixture of passage graves and dolmens, the oldest dating from between 3000 and 2500 BC. The whole scene is overlooked by Queen Maeve's tomb on Knocknarea. Guided tours or self-guiding options are both available at the Visitors Centre. The guided tour and exhibition explains the story of Irish origins and connections to distant lands such as Sweden, France, Britain, and Spain. A leisurely 15-minute drive to the east of Sligo lies the scenic Lough Gill, eight kilometers in length and an angler's paradise stocked with salmon, trout, and pike. The picturesque lake is encased by woodlands, which are dotted with nature trails and viewing points. The lush hills of Slieve Killery and Slieve Daean rise above the south shore. Understandably, the area is a birdwatcher's and photographer's dream. A drive around the lough of some 37 kilometers is an experience not to be missed. On a peninsula between its northwestern end and the River Garavogue stands Hazelwood House, a beautiful little Palladian mansion by Richard Cassels (1731). On Sligo's Stephen Street, on the north side of the River Garavogue, is the County Museum and adjoining art gallery. The County Museum, in the old rectory, contains material on the history of the region and mementos of W.B. Yeats, including first editions of his works, letters, and family photographs. The Museum opened its doors to the public in 1955. The gallery displays an impressive and extensive collection of paintings by Jack Butler Yeats (brother of W.B. Yeats) who's considered to be one of Ireland's greatest artists. Sligo Abbey, a Dominican friary, was founded by Maurice Fitzgerald in 1253 and rebuilt in 1416 after a fire. The church has a double aisled nave and transepts; the choir dates from the original foundation and the transepts are from the 16th century. Notable features are the canopied tomb of Cormack O'Crean, on the north side of the nave, with a crucifixion and other figures in low relief, and the O'Conor Sligo monument (1624) on the south side. Three sides of the beautiful 15th-century cloister have survived, along with the 13th-century sacristy and chapter house. A short two-minute stroll from the museum brings visitors to the Yeats Society building by Hyde Bridge. The art gallery here puts on periodic exhibitions, and in summer an audiovisual show documenting the connection of Yeats with Sligo. The Society offers programs and resources to those interested in Yeats' poetry such as a summer school, an art gallery, a poetry circle, Poets' Parlour, and a reference library. There's a café where visitors can relax and indulge their poetic leanings if desired. This restored plantation-era castle of the early 17th century is a popular tourist attraction picturesquely situated on the shores of Lough Gill and was once the home of Robert Parke and his family. Irish oak crafted using traditional methods was used to restore the castle. The courtyard grounds also reveal evidence of an earlier 16th-century tower house formerly under the possession of Sir Brian O'Rourke. Radisson Blu Hotel & Spa, Sligo: 4-star hotel, bucolic setting, modern room decor, lovely indoor pool, spa with steam room and hot tub. Riverside Hotel: mid-range pricing, river views, convenient location, friendly staff, excellent free breakfast. The Glasshouse: affordable rates, riverside location, colorful rooms, fitness center, fine dining restaurant. 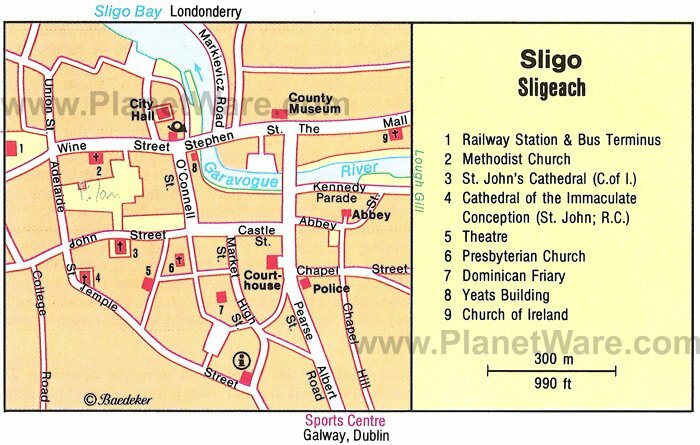 Sligo City Hotel: budget-friendly hotel, central location, friendly reception staff, family rooms.